A Review of Hydrologic and Water Quality Models used for Simulation of Agricultural Pollution (V. Novotny). Developments in Ecological Modelling (S.E. Jørgensen). Rainfall Abstraction and Infiltration in Nonpoint Source Pollution (J.W. Delleur). Lateral Movements of Vadose Water in Layered Soils (A. Giorgini, M. Bergman). Erosion and Sediment Transport Processes for Agricultural Watersheds (G.R. Foster). Simulation of Sediment Yield From Alpine Watersheds (G. Fleming and S. Fattorelli). A Simple Model for Assessing Annual Soil Erosion on Hillslopes (R.P.C. Morgan, D.D.V. Morgan and H.J. Finney). Some Aspects of Soil Erosion Modelling (D. Torri, M. Sfalanga). The Application of an Agricultural Water Balance and Erosion Model in Environmental Science. A User Perspective (T.E. Hakonson et al.). Validity and Limitations of Different Transport Models with Particular Reference to Sediment Transport (G. Di Silvio). Selection and Application of Models For Nonpoint Source Pollution and Resource Conservation (R.A. Leonard, W.G. Knisel Jr.). Simple Models to Evaluate Nonpoint Pollution Sources and Controls (B.N. Wilson et al.). Integration of Runoff and Receiving Water Models for Comprehensive Watershed Simulation and Analysis of Agricultural Management Alternatives (A.S. Donigian Jr.). Field Scale Simulation of Nutrient Losses (G. Bendoricchio, A. Rinaldo). Modelling Subsurface Drainage and Water Management Systems to Alleviate Potential Water Quality Problems (R.W. Skaggs, J.W. Gilliam). Runoff and Receiving Water Models for NPS Discharge into the Venice Lagoon (A. Rinaldo, A. Marani). Distributed Parameter Hydrologic and Water Quality Modelling (D.B. Beasley). Models of Statistical Distribution for NPSP Concentrations (A. Marani, G. Bendoricchio). Development, Testing, and Applications of Nonpoint Source Models by Evaluation of Pesticides Risk to the Environment (L.A. Mulkey et al.). Field Data Acquisition Systems (L.F. Huggins). 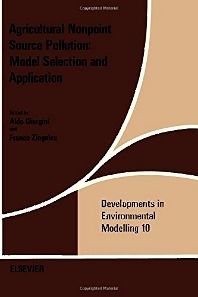 This volume contains most of the scientific contributions to the workshop Prediction of Agricultural Nonpoint Source Pollution: Model Selection and Application'' held in Venice, in the historic Ca' Vendramin Calergi, in June, 1984. Other contributions of specialists who were not able to attend the workshop have also been included in an attempt to make the work more complete. It is hoped that this collection will be useful to planners who operate in the field of agricultural diffuse source pollution, since several contributions are state-of-the-art presentations and others are specialized studies by American and European researcher.